With the changes to the eBay pricing structure at the end of March, there has been an estimated 30-40% increase in listings in the category of "Baseball Cards". So as a sporadic, periodic, or frequent seller, what can you do to insure your listings don't get lost in the shuffle. eBay 101 is being sure to use a detailed, yet straight forward, title that contains the key words necessary to produce a result in the search listings. eBay 201 is maintaining the mandated minimum DSR (Detailed Seller Ratings) scores. eBay 301 and 401, respectively, are creating bid inducing item descriptions and page listings. For newer cards, for the most part, if a seller has a decent feedback rating and a fair price, that's all that is really necessary to turn listings into sales. With vintage cards it is a bit different. Vintage buyers are a different breed and come in many shapes and sizes. Some are starting, filling, or upgrading sets while still others are chasing perfection on every card, including commons. 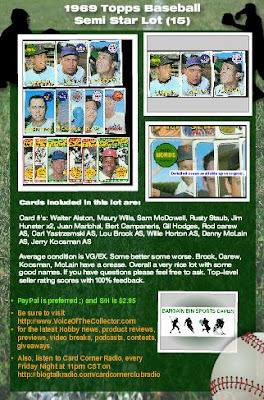 Creating a professional page listing that looks more like the cards are coming from a business and less like from a guy with a shoebox full of vintage cards in his Mom's basement is what I have realized might have been lacking in my previous listings from The Vintage Consignment(s) and more importantly now that I am parsing out high number, semi star, and common lots, I thought it was time to up the ante. I recently came across a great tool for creating stylish page listings from an HTML template generator called http://www.pagemage.com/. The interface is very turn key and user friendly, seamlessly integrates with eBay itself and your listings can be posted to social media and networking sites like Facebook, Blogger, My Space and more. The best thing is that it is FREE for up to 24 listings per month. Here is a snapshot of one of my first go-arounds and a link to the actual listing. TNA Ushers in "New Era"